recently there’s been quite a bit of roadwork around here. driving into the office is slightly more lengthy than usual. the sit and wait for other cars, trying to get to work on time…it can be frustrating. 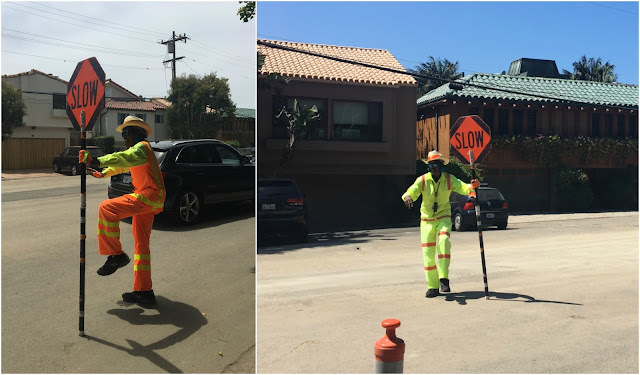 unless you are lucky enough to witness the happiest traffic flagman ever, carey steger. literally every time i pass him he’s dancing! and he’s really good! showcasing michael jackson’s epic moonwalk, one of steger’s most popular moves, or a james brown imitation that leaves you scratching your head. seeing him puts a smile on my face, you really can’t help it, and gives me faith in the human race when there’s so much unhappiness. called “the moonwalker" or "the king of traffic", to name a few, i call him the happiest guy ever! could you imagine a world like that? where everyone is happy doing what they do? where people take the time to compliment a job well done instead of only taking time to criticize? carey is covered head to toe in his workman’s garb - love the cowboy hardhat - in the summer heat surrounded by people that are angry because the line isn’t moving fast enough for their taste. doesn’t faze him, the guy is seriously happy! new lesson for my to do list. be happy! no matter. it can only makes things better. if you find yourself on the other end of it try to make an effort to turn it upside down. put some upbeat music on and try, just try, putting some moves to that. Love this! And can I say, you have the legs of a teenager!